Sledge faces trouble close to home in this episode as a group of vigilante cops begin a killing spree under the guidance of new DA Evelyn Collins (Janice Lynde). 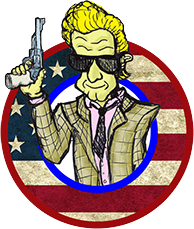 Hammer looks to infiltrate the group, which includes colleagues like Officer Braddock (Mark Rolston) and Officer Jackson (David Leisure). Before the undercover work Hammer and Doreau begin their investigations by talking with recently released convict Rudy Mednick (Jay Rasumny), but his death prompts a change of strategy. It’s a good week for Captain Trunk too, as he gets to simulate a fight with Sledge to easy the Inspector’s passage into the vigilantes’ confidence. Chuck Braverman helmed the second of his six Sledge Hammer episodes. The episode was written by Jim Fisher and Jim Staahl, the second of their two contributions after Season 1’s To Sledge, With Love. 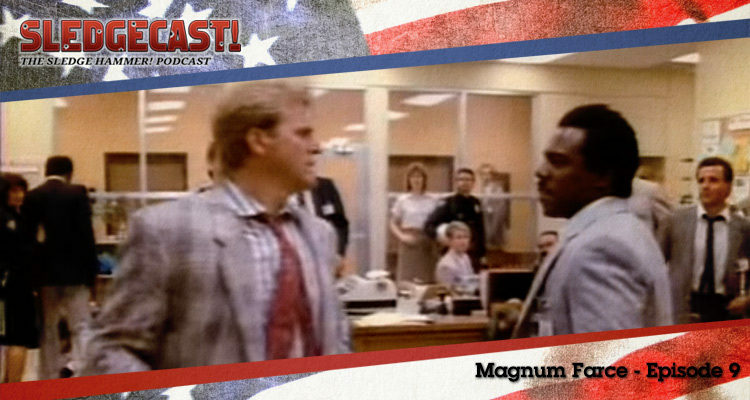 If you have thoughts on any aspect of Magnum Farce, please share them below, or find us on Twitter at @sledgecast. Magnum Farce was released in 1986. It is 30 minutes long and originally aired on the ABC network. This episode is available on the Sledge Hammer DVD box set from Laser Paradise (German/English language) in Region 2 and from Image Entertainment in Region 1 (USA).